In addition to the sophisticated features such as 6-segment/center-weighted/spot metering and TTL phase-matching autofocus system incorporated into the ZX-5, PENTAX added an electronic preview feature, exposure memory lock and auto bracketing (up to +/- 1 EV) to update this classic beauty. First, let me just say that comparing the Pentax ZX-5n to cameras that cost two to fives times as much is specious at best; it's rather like comparing apples and oranges and rather unfair to a quality product designed for the (advanced) amatueur. If you want a professional-grade camera, buy the MZ-S and quit whining. I've been a Pentax user for more than 25 years and still carry my old K2 in my camera bag. However, as I've gotten older I've noticed that focussing manually is not as easy as it used to be, so I began shopping around for an AF camera. Naturally, all my lenses were Pentax, so I decided to stick with the brand. After considerable shopping around and comparing different Pentax AF cameras, I decided on the ZX-5n, and have been quite happy with my choice. Perhaps most of all, I like the ergonomics of this camera. It fits well in the hand, and if it's too small for you, I suggest getting the AA battery pack. The knobs on top of the camera handle most of the functions, and for those of us who don't really like dealing with numerous menus, this is a great feature. The viewfinder information is adequate (shutter speed, f-stop, etc. ), although sometimes hard to read in very bright light, and everything else is shown on the LCD display on the top of the camera. The autofocus is not particularly fast, and does hunt in low light conditions. For me this is not a great problem since most of my photography involves landscapes. As for its plastic construction, the ZX-5n can still take a fair amount of punishment--not that I'm into camera abuse--and is certainly no less robust than other cameras (Nikon N80, for example) in this price range. I very rarely use the mirror lock-up on my K2 (even with its heavy shutter), so don't miss it on this camera. If I have one complaint, it involves the light meter, which tends to underexpose by a third of a stop (this is why I gave this camera four stars for an overall rating rather than five). However, I've calibrated the light meter and now simply adjust the ISO by one-third stop. All in all, this is a fine camera for the price, and coupled with the Pentax 24-90mm lens will meet most of the intermediate user's needs. I've never used it to service a product, but have contacted them with questions about certain features, and have always received a quick reply. light (if you think thats good) manual override never any problems with camera its self it still works perfect like when i got it new! first off i would like to say that i think this is a great way to help people figure out exactly what camera they need. i have had my ZX-5n for about 2 1/2 years. i have to say it has worked for me in lots of different fields. this camera has been great for me, it went everywhere ... my apt. burnt down one winter night and the only thing i grabbed was this camera and needless to say i photographed it as it was on fire. its been with me to Calif. where i went on mountain climbs and hikes in the bush. to nyc to shoot the buildings ... the camera is still in perfect working order. it is a smaller camera when you compare it to some of the nikons, but there is a AA pack for it, that will help for the handling and over-all look. i was a manual camera fan until this camera ... it has the complete override of the auto features, this was great for me, i like to still have control of my shots. the knobs on the top of the zx are also a plus. the knobs control just about all of the features on the camera, so you dont need to take your eye off of the shot to look for your buttons. the AF hunts alot on lines even with top lenses. the view finder shows all of the info that you need and does something that i find nice ... the info in the finder lights up brighter when you are shooting in bright light (such as a sun set) , so you can still make out all of your settings. it has a flash that i didnt really use, but is great if you dont want to lug around a flash unit you just push a button and it pops up. it is a plastic camera so you need to keep it in your bag ( i dont like this) i found myself babying this camera. i didnt want to bang it into anything (not like i play football with my cameras)...BUT i do like a solid camera and this i feel is not. (now is where the pentax people are going to get mad lol) i find that this is a really good camera for what it is but i needed to have a camera that can take some punishment. for a camera that will take pretty nice shots (not pro) you will be happy. if your looking for something that will change your life and make you feel you can do those shots that others cant get a nikon f100 or f5. but i dont think that will be a problem with most people (nikon=$$$)dont worry, this camera does lots you will be happy for the price. and everyone says that its only the lenses that makes the great photos, although this is true, take into account for the feel of taking the shots, a great camera will give you the inspiration of great photos. you will feel that if you have a no-hold-back camera, you can do anything! for the people out there that want to take great photos and are extremely serious about doing photography for money get a nikon f100 or for about the same price an f5 used in 9 condition. dont worry about thinking that you wont know how to use it, its better to start learning on a top camera, this way you will have more time with it and get better along the way. trust me it will be worth the money, just save up for it TRUST ME lol. Convenience in use. Lens compatibility. Mirror lock-up would really be a hit. It is, by the way, available in many rival models, such as Canon Eos 50. A good camera because of convenience in use and a good exposure metering system. I would say better metering than rival models, because of its giving more weight to the details in the shades. It broke just a month ago. Trying to get in touch with a company to fix it. Pentax ME. All kinds of Pentax lenses and non-Pentax cameras. no mirror lock-up but haven't missed it so far. I bought this camera for the bright viewfinder (it has a real pentaprism). It is a great camera! I've used it to shoot a wedding, and to do family portraits, as well as landscapes. It has quickly replaced my Pentax MZ-M as my favorite camera to bring. MZ5n with AA pack is light and balanced with all features that the amateur is likely to need. The analogue switches are easier to read at a glance - compared to digital multi-purpose menus on an LCD panel, especially in bright light. This makes the camera quick to use. Light, easy to use, small, it doesnt make u look like a serious pro. I want a T button for long night exposures without burning the batteries. I want the ability to do multi exposure. There is plastic even inside. Autofocus hunts too much. It doesnt make u look like a serious pro. Bought this after owning a Pentax MX which started having an unreliable shutter, and it is a good camera, easy to use, the things i would like different is the crome finish, i prefer black cameras, and get rid of that silly indented viewfinder info on the right, why didnt they put it in the bottom of the viewfinder? Every time i want to open the back, i grab the exposure compensation button to lift it, it is so similar to my old mecanical camera. I want my MX back, nothing comes close to it in finish and solidity. User-interface, backwards compatibility, full featured. No mirror lock-up for super close macro work. The ZX-5n became an instant classic when it was introduced, mainly because of a superior user-interface. It is one of the few modern SLR's that a moderately experienced photographer can use out-of-the-box without a users manual. Although it lacks a few nice, but rarely used, features (lock-up mirror, double exposure) every feature is at your fingertips, simple to use, and easy to understand. Full manual control or simple point-and-shoot automation are equally straightforward. You can also use older manual Pentax lenses, some of which are world-class, on this modern body. I have avoided the thing I hate most about photography: getting into the field and having to spend precious time trying to remember exactly how the equipment works. It also avoids the biggest trap of modern technology: too many auto programming features. This results in either having too many options to remember, or worse, not remembering how you got the result you got after the fact. This is a truly great SLR. I purchased my ZX-5n about three years ago and have found it to be a very reliable, straight-forward and easy-to-use camera. 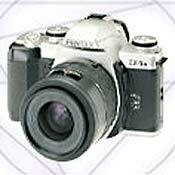 I had used a Pentax Super-Program camera for many years and loved it but wanted a more up-to-date auto-focusing camera. So when I went to a camera store in Myrtle Beach and had planned to purchase a Minolta, the dealer persuaded me to try the ZX-5n based on the fact that I could use my old Pentax lens with the new body. I purchased this body along with two lens (a 28-80 & an 80-200mm. Originally, I though this would be a camera my wife would love -- light, easy to use, and metering right-on. I had plans to buy a Nikon system for myself which I did eventually purchase and love. However, I must admit that for easy of use and portability, I find myself carrying the Pentax ZX-5n on more occassions than my Nikon F100 or F5. Recently I lugged my Nikon armor around England, Wales & Ireland and was exhausted. I wished I had taken the Pentax for obvious reasons. I have not used Pentax Repair Service yet, but would expect it to be good. Matrix metering is accurate and dependable. Spot metering, excellent for available light photography. Nostalgic interface (shutter dial, aperture controlled on lens, P/Av/Tv/M). Lightweight and small. It is NOT solid build (lots of plastic). The autofocus is NOT as fast and accurate as Nikon F90x and later. This camera uses 2 CR2 batteries (AA grip is available though). You can not use a manual cable release on this cam, it uses it's on, MZ-range based electronic cable release. Shutter is fully electronic. And that's about it I guess. The MZ5 is my prime camera at the moment and about my current best friend. It's a lot camera for the money.